Zagreb redeemed itself today. What a great city. Fabulous buildings, lots of green spaces, hidden nooks where there’s usually a beer or a coffee to be had and you can slip away from the crowds, trams in the brightest blue cross-crossing the city, a Museum of Arts and Crafts with the most astonishing furniture exhibits, and a wonderfully eccentric botanic garden that, in addition to being delightfully unkempt, has the world’s biggest collection of plant labels and turtles swimming in the lily pond. Filled our day and walked for miles and still it remains the most difficult place to find a snack lunch – we’re beginning to wonder if the Croatians only eat after dark! 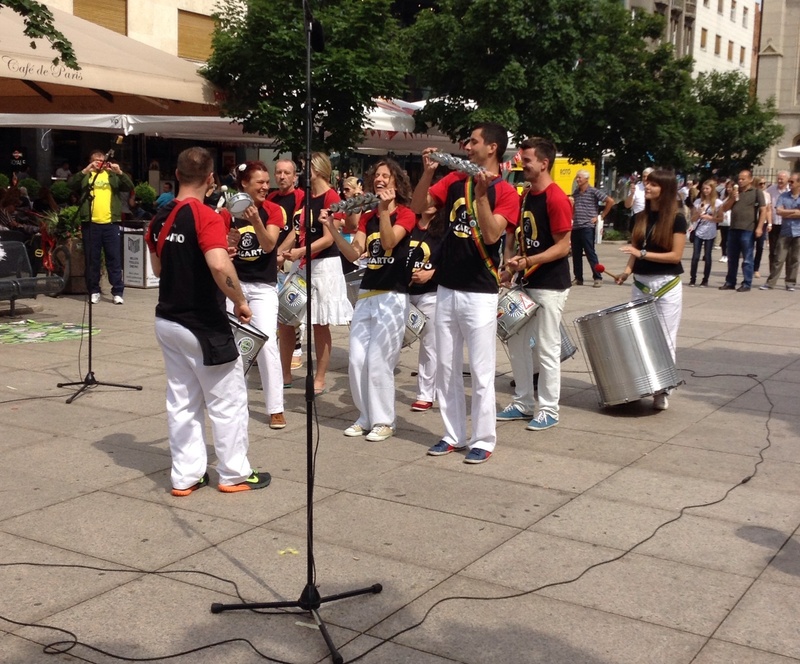 We came across this steel band doing a street gig for TV. Three bejewelled dancers with exotic feather headdresses are just out of shot on the left. They were eye-catching, it’s true, but the prize for the most arresting image of the day goes to the girl in the front row second from the right with a sort of horizontal multiple tambourine-type instrument and the most infectious smile. She is most definitely not called Jana! The sun came back and Zagreb showed us some of her treasures. If England would just do its stuff tonight then Jim will be a very happy man. I’m wanting to hit Zagreb already – even if one does have to bring one’s own sandwiches. Our 25C pales next to your 35C… Blimey, that’s HOT. Remind me to tell you about Eugene Onegin at Glyndebourne last night, dahling. It was the experience of a lifetime, albeit not in the same class as your Slovenian sojourn. We’ve come over all old-fartish and decided not to wait up for The Match tonight – despite the fact that the entire street is, as I type, barbecuing and whooping it up until kick-off at 11pm, so it’s ridiculous to think that sleep will even be a possibility. Lovin’ your blog, keep it coming!